Single Room Occupancy or SRO hotels are low-cost urban housing for longer-term to permanent residency by lower income occupants, some of whom are formerly or otherwise would be homeless. 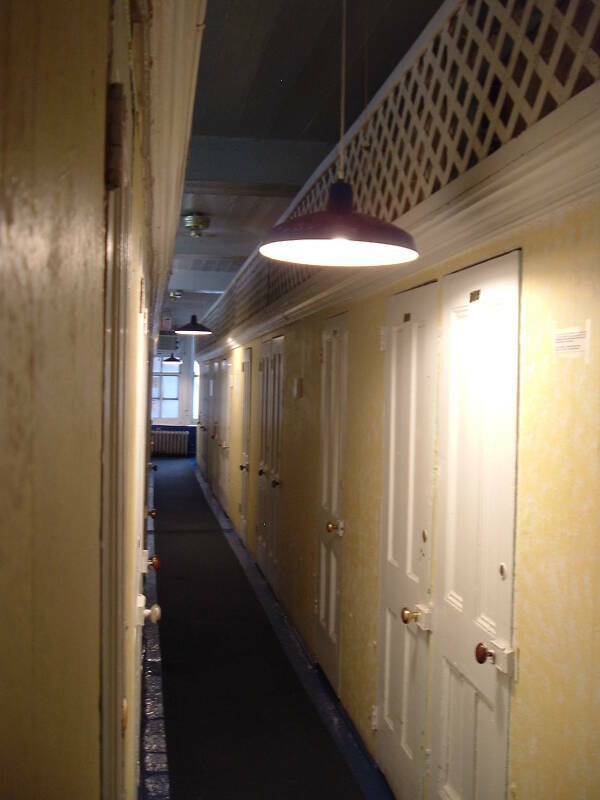 Most SROs were built in the late 1800s through the early 1900s, with a boom in conversions of existing hotels to the SRO format in some cities at the end of World War II. Their numbers decreased in the 1960s and 1970s, and now they are rapidly disappearing under the pressure of urban renewal and increasing gentrification of former skid row areas. The term "single room occupancy" and acronym "SRO" are used in the U.S. and Canada. The term bedsit is used in Britain, and chambre de bonne in France. Face-to-face in Nigeria refers to a similar but slightly larger design for one-room and two-room apartments. Below are the exterior and interior of the White House Hotel at 340 Bowery in Manhattan. It opened as an SRO around 1900 and became a combined SRO and hostel around 2000 and continued as such through 2014. It's the dark brick four-story building, the blue doors are the main entrance. The SRO buildings were mostly constructed in or near the business centers of larger cities in the U.S. from the late 1800s through the early 1900s. The Oxford English Dictionary cites the earliest known published use of the term "single room occupancy" in 1941, although the term originated in New York City in the previous decade and the concept goes back at least fifty years before that. They began to be built in the late 1800s in Chicago to house a large transient workforce that entered and left Chicago on a seasonal basis. There are estimates that 40,000 to 60,000 people, mostly men, lived in SRO facilities during the winters around the turn of the 20th century. Hobos of the early 1900s, before 1920, were transient workers and many were quite skilled. They tended to do work outdoors, and stayed in SROs and dormitories over the winters in Chicago and other northern cities. By the 1920s the West was mostly settled and the number of skilled migrant jobs declined. Tramps were men who traveled but did not work, while Bums lived full time in the SROs and other even cheaper housing. Some SROs had originally been hotels of a more luxurious interior layout, converted to the SRO format to greatly increase occupancy. Many of them, like the White House, followed what became called the "cage hotel" or "hall room" design. The rooms — really cubicles, sometimes called "cabins" — were small compartments divided by walls that did not extend all the way from the floor to the ceiling. The second picture above shows a corridor within the White House. Each floor of the building was two large rooms. The walls of the cabins or cubicles were fastened to the floors but they only extended up about seven feet. Wooden lattice work, like trellis material, was used to cap the cubicles and keep people from climbing over the wall from one to the next. Some SROs used chicken wire, hence the "cage hotel" term. Why were the rooms open at the top? With only lattice or chicken wire across the top, the lighting, heating, and ventilation would not have to be duplicated for each room. Once safety codes came to require fire suppression, a few widely space sprinkler heads covered several rooms each. Each cubicle extended about six feet in from the doorway and about four feet wide. Just enough room for a small bed. This was a wooden shelf with a narrow foam mattress. A small wooden storage cabinet, a few hooks on the wall, and a fluorescent light fixture completed the guest quarters. All plumbing — sinks, showers, toilets, and some enormous urinals of the early 1900s design — were shared and located at the ends of the corridors. Of course, shared plumbing facilities were very common in hotels before the 1940s. At least the cage hotels offered some privacy. Dormitories had no dividers, they were simply large rooms filled with beds. Flop houses didn't even have beds, you paid for the right to sleep indoors on the floor. Charitable, state, and federal programs pay part or all of the rent of many financially disadvantaged SRO tenants. Tax abatements can support renovation, provided that the resulting space is rented to low-income individuals. But the urban decay of the 1960s and 1970s in the U.S. led to decreases in SRO housing. 81% of the SRO housing disappeared in Chicago between 1960 and 1980. 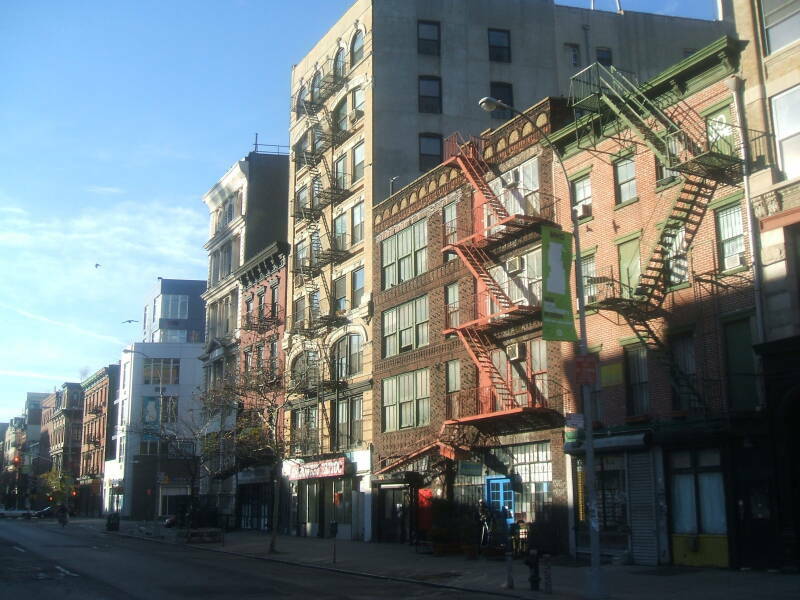 Continuing development and gentrification greatly increases pressure on remaining availability as former SROs are converted or demolished as their tenants are evicted. Some cities, including San Francisco, have more recently enacted regulations on the conversion of SROs to reduce the eviction of tenants. Many San Francisco SRO landlords also charged "visitor fees" as a means of taking a cut of prostitution and drug dealing in their properties. These "visitor fees" became illegal in 2001. 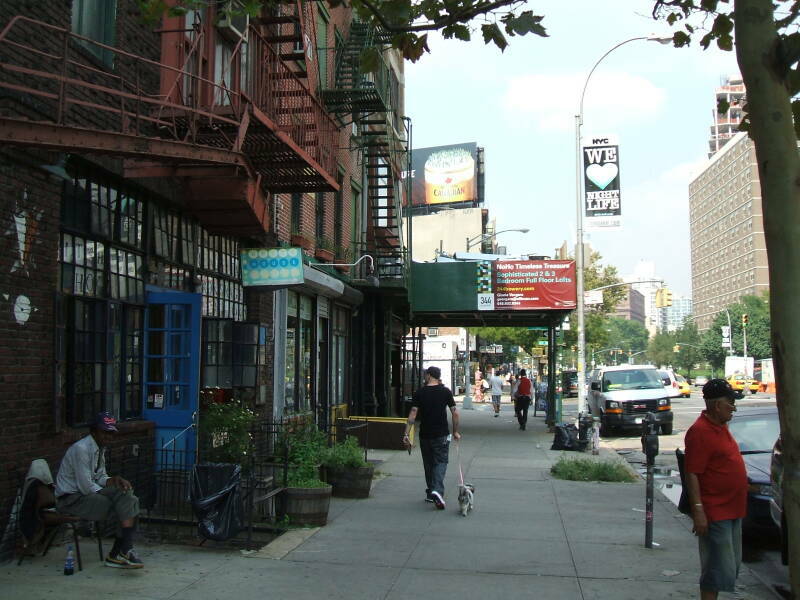 1825 340 Bowery was the location of a tavern where the members of the New York Pigeon Club met. 1875 Two brothers ran the Blooms dry good store at that address. 1881 In 1881 it housed Emil Kronner's dime museum where the New York Sun reported that the owner was arrested for "giving a sacrilegious performance...after losing two freaks." 1899 A flophouse (or possibly dormitory) named the Bellevue Hotel was operating there. 1905 A census recorder in 1905 listed 70 men who lived at the address, but that number was growing. 1907 The NoHo Historic District Extension report by the New York City Landmarks Preservation Commission (2008) says that the missions and SRO hotels in the 14-block area housed 25,000 men on a typical night in 1907, a number later increasing to 75,000. 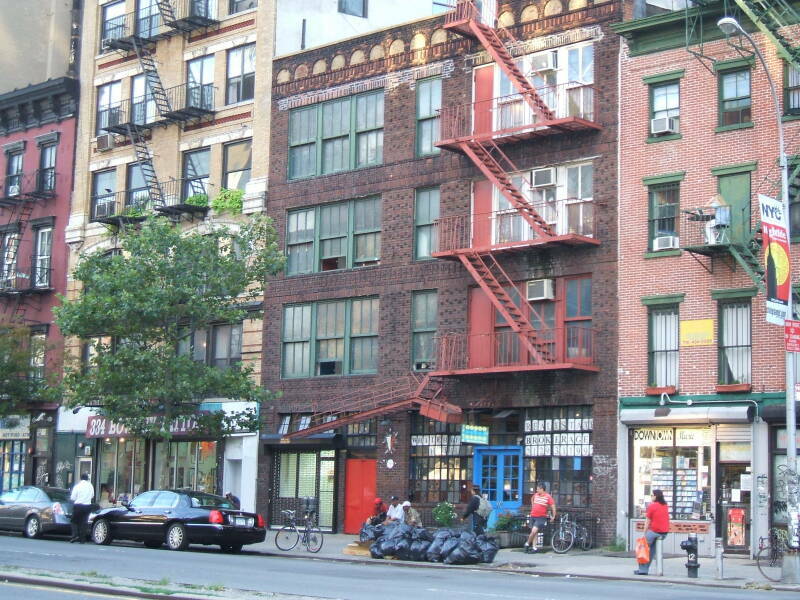 Eusebio Ghelardi purchased the property at 340 Bowery in 1916. He was an Italian immigrant who had worked as an inspector for the New York City civil engineering department. That same year he added a two-story extension to the rear. 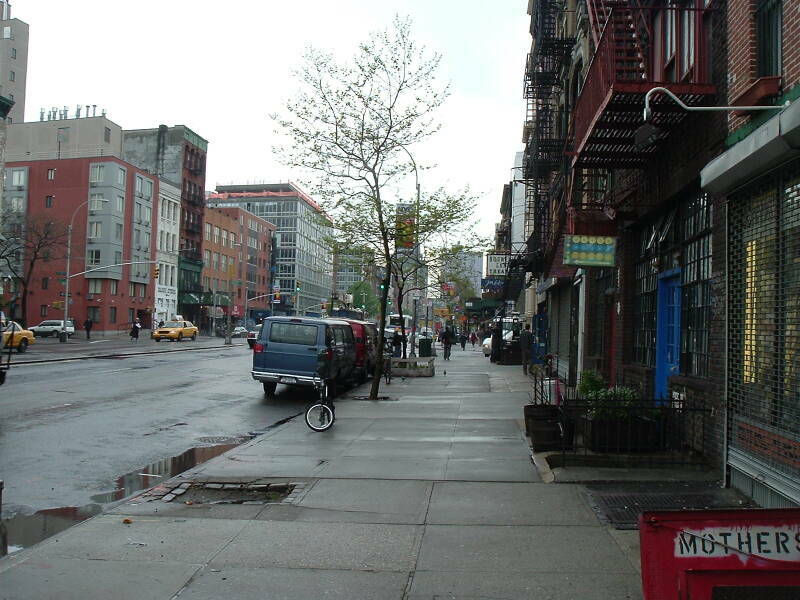 In 1928-1929 he expanded onto the lot to the south, 338 Bowery, and built a unified brick façade across 338-340 Bowery. 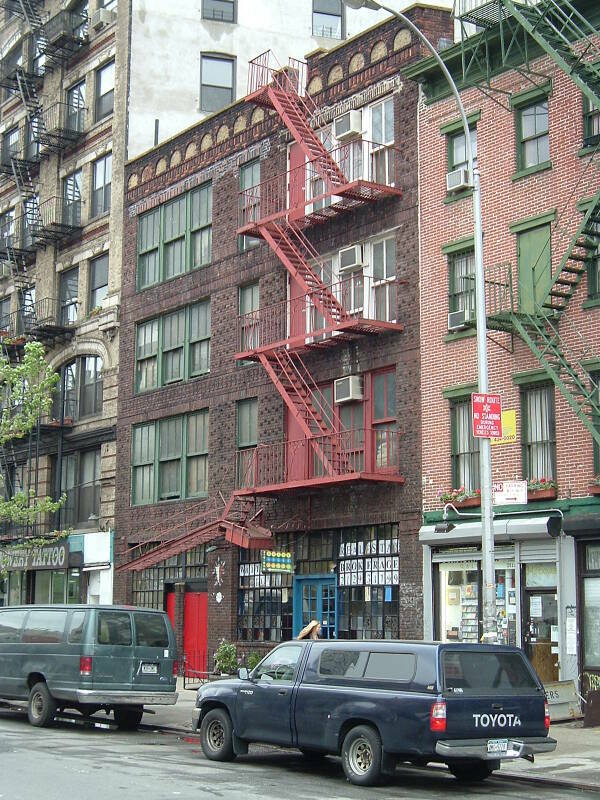 Features: Four-story double building; rusticated brickwork; wrought-iron fire escape; 1st floor: historic steel casement windows with random panes of stained and colored glass; non-historic store window (at No. 338 Bowery) with security gate; non-historic doors; non-historic hanging sign on historic bracket; 2nd-4th floors: historic kalamein windows, some converted to doors; decorated brick spandrels; Cornice: brick parapet with stuccoed brick blind arcade; Site features: basement passageways connecting to the rear of the building; wrought-iron railings. History: The White House Hotel began operating at 340 Bowery about 1916-17 and took its present Arts and Crafts-influenced appearance in 1928-29 when the Ghelardi family expanded their lodging house to incorporate the lot to the south of their property and constructed the current unified façade with its blind arcade and rusticated brickwork. Accommodations in most Bowery flophouses were either a choice between a cot in a dormitory or a cubicle. The White House offered residents the relatively private cubicles. The White House maintained a whites-only policy for much of its history and this is said to be the inspiration for its name. The White House, now serving a diverse clientele, is still in business, one of the last hotels of its type on the Bowery. The building which is largely intact to its early to mid-twentieth century appearance contributes to the mixed-use and architectural diversity of the NoHo Historic District Extension. 1916: Two-story extension to 340 Bowery. Owner: E. Ghelardi. Certificate of Occupancy: lodging house. 1928: Extend building to south (no. 338 Bowery), add new façade to 340 Bowery. Owner and builder: E. Ghelardi. Certificate of Occupancy: store and lodging house. David Isay and Stacy Abramson, Flophouse: Life on the Bowery (New York: Random House, 2000), xiii-xiv, 3. New York County, Office of the Register, Deed Sect. 2 Liber 232, p. 436, 438; Liber 3664, p. 296-97. The Third Avenue Elevated train line ran above the Bowery from 1878 to 1955, making the thoroughfare darker, dirtier, and noisier. There were 234 cubicles in the building by 1950. They were 6×4 foot cubicles with walls that stopped well short of both the floor and ceiling. Chicken wire mesh was fastened across the tops to keep someone from climbing over the divider into another cubicle. 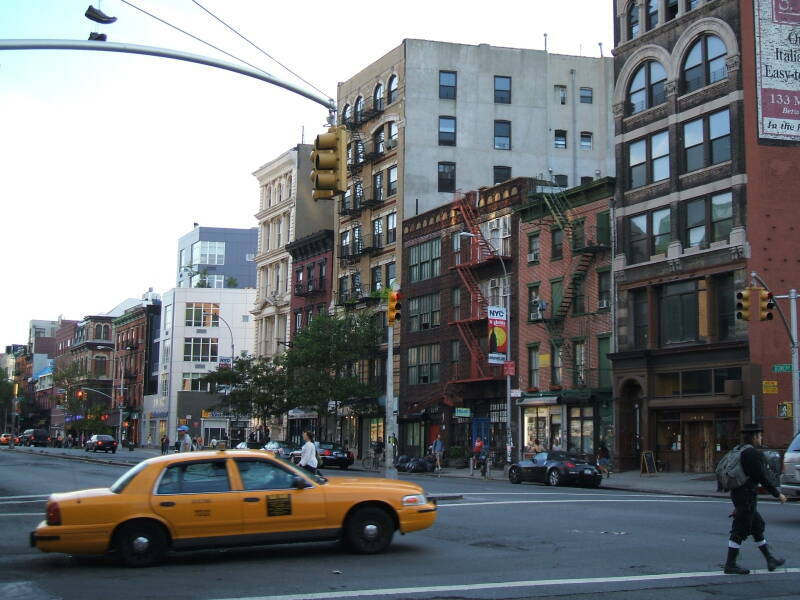 Next: We will see how the Bowery evolved from New York's theatre district in the late 1800s into Skid Row through the second half of the 20th century. Many men were released from military service in New York after World War I. Then there was the economic hard times of the Depression. And then there was a larger military demobilization after World War II. Those men were placed in SROs temporarily and given money to make their way home. 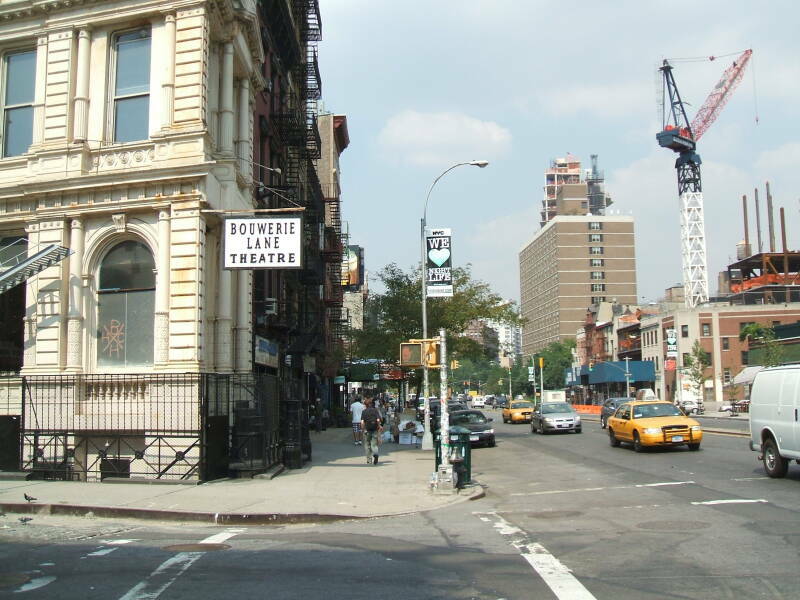 Many of them never left the Bowery.